Do you need a mouth guard? Studies suggest those who grind and clench their teeth may experience up to 80 times the normal tooth wear per day compared to those who do not. These are the common indicators that you may need a mouth guard. Stock Mouth Guards: These are available from pharmacies or sporting goods stores. They come ready to where and little can be done to adjust their fit. They are bulky and breathing with these in can be difficult. These are not recommended by dentists. Boil and Bite Mouth Guards: These are sometimes referred to as sports mouth guards. These can be purchased from many sporting goods stores. These are made from a thermo plastic material that will soften in boiling water and will shape around your teeth when you bite down. These will have a better fit than stock mouth guards. 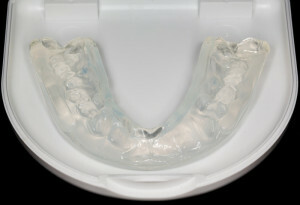 Custom Fitted Mouth Guards: These are made by your dental office / dental lab. Your dentist will make an impression of your teeth. Special materials are used to for flexibility and durability. They are usually built up in layers. These mouth guards provide the most comfort and protection. They take much more time to prepare so they are more expensive. Dr. Reem Kidess, DDS provides custom fitted mouth guards in her Paradise Valley, Arizona dental practice. To ensure the best fit possible, Dr. Kidess will prepare a mold of your teeth and mouth to design a custom-made night guard. This plastic occlusal splint (mouth guard) will be designed to fit over either your upper teeth (upper splint), lower teeth (lower splint) or your front teeth (anterior splint). Dr. Kidess will provide the best mouth guard for your needs.